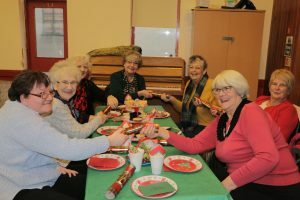 A number of Dundee not-for-profit organisations with support from the business community have thrown a cracker of a Christmas party for over 100 older people at risk of isolation this Christmas. 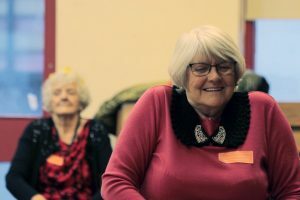 The party was organised jointly by Helping Older People Engage (HOPE), Dundee Voluntary Action, Royal Voluntary Service, Dundee Community Transport and Dial-OP and Go. The Christmas cracker, which was free to attend, kicked off at 2 pm on Wednesday 28th November at Menzieshill Community Centre. Party guests tucked into sandwiches, cakes and treats, with the festivities also featuring a raffle and live music courtesy of Wayne O’Hare and a choir from St Paul’s School. 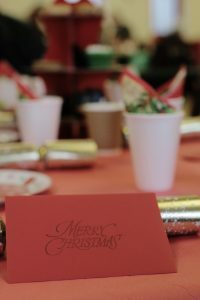 The event was boosted by generous donations of food, vouchers and money, courtesy of a number of businesses. The show of solidarity from the business community helping to banish Christmas isolation consisted of Asda, Tesco, Morrisons, Scotmid, M&S, Spar, Fisher and Donaldson, Scott’s Butchers, Hobbycraft, Bield Housing Association, Blackadders and the Rotary Club of Dundee.